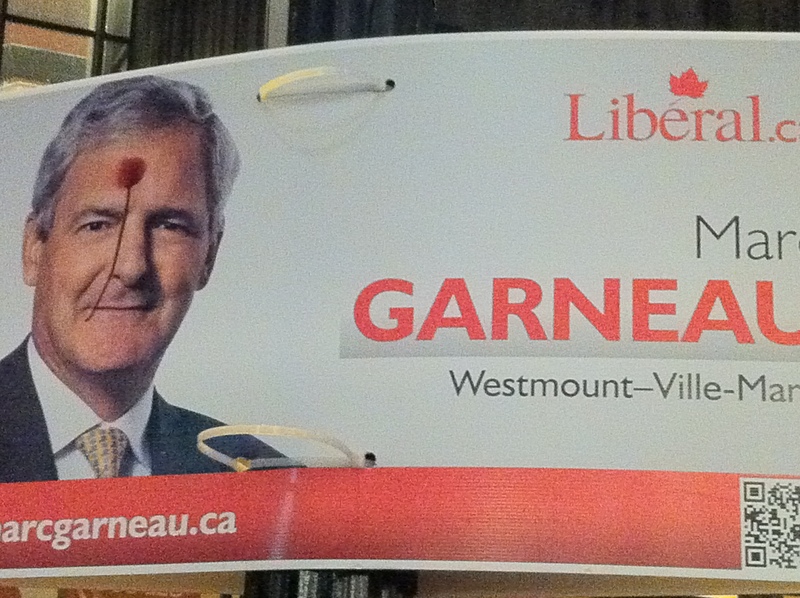 I’m not sure if other candidates’ signs were similarly targetted, but in Montreal last night, I noticed Marc Garneau signs with a vaguely unsettling red marks painted on his forehead. The splotch looks a bit like it was made by a paintball round. Sign vandalism is an unattractive part of nearly every election campaign. In the first week of this campaign, Nepean-Carleton Liberal candidate Ryan Keon’s signs were embellished with spray-painted targets over his face. There have also been reports of vandalism of Conservative candidate’s signs in the Ottawa area. Rarely, of course, are other competing campaigns to blame for the vandalism. FURTHER UPDATE: A photo submission from the NDP war room, showing the sign for Jeff Itcush, candidate in Mount Royal. Itcush is Jewish. The picture was taken four days ago. I couldn’t believe it! He’s actually enjoying lying to us on national TV, just like Paul Ekman’s description of Philby’s lying smirk in Malcolm Gladwell’s “Blink”. Harper lacks Phiby’s skill; he can’t control his “duping delight” he smirks and smiles contemptuously because he thinks he’s fooling us and he just loves it! OK, you can breathe again now. But get to work on this – please.